Bay Orthopedic opens Scoliosis Brace Clinic in Boston Suburb of Massachusetts. Bay Orthopedic is proud of two of its patients achieving success with the Curvy Girls. 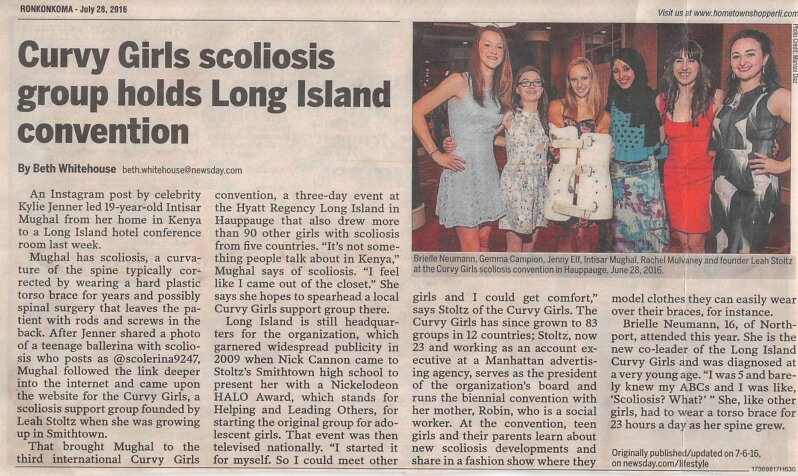 Brielle Neumann (far left) has been elected co-leader of the Long Island Chapter of the Curvy Girls and she is posing with Leah Stoltz (on the far right) who is the young lady who founded the Internationally famous Curvy Girls Scoliosis Support Group. Jenny Elf another patient of Bay Orthopedic and longtime supporter of the Curvy Girls is in the center holding a brace. Bay Orthopedic opens Scoliosis Brace Clinic Office in Ridgefield Connecticut. 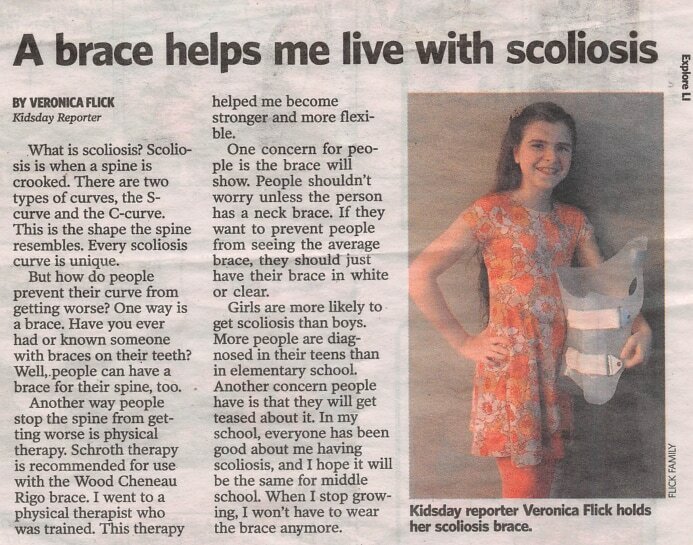 Bay Orthopedic opens two Scoliosis Brace Clinics in New Jersey. 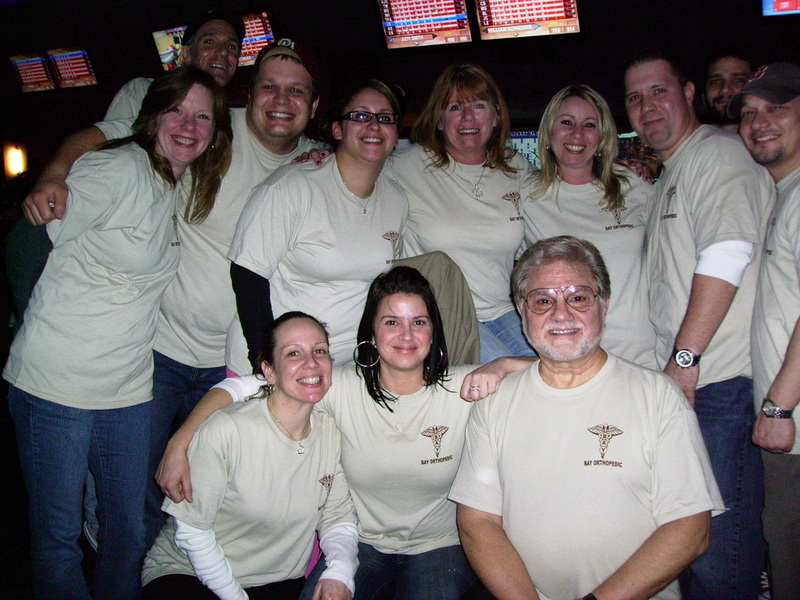 Bay Orthopedic donated over fifty spinal braces to Physicians for Peace for the purpose of being utilized in disaster stricken areas of the world such the victims of the Haiti Earthquake and Typhoon Haiyan in the Philippines. 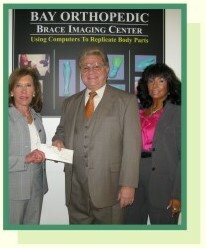 Spinal Brace donations is an on going charity function of Bay Orthopedic and Rehabilitation. Michael Mangino, C.P.O., C.Ped. and Michael Eastwood, C.O., C.Ped.have been awarded a U.S. Patent for their Impact Sport Shield that was designed to absorb the impact of a sporting projectile like a ball or a puck traveling at high speeds and reducing the impact to levels below which fatal Commotio Cordis can occur. The device was a unique blend of Kevlar® Polyurethane gels, bellowed nitrogen and LDPE encapsulated utilizing modern spinal brace technology. Lynn Cohen, New Market Development (left), thanked Bay Orthopedic's Michael Mangino, CPO, CPed, and Carol Mangino, certified orthotist, for their company's generous gift to the hospital. Mr. and Mrs. Mangino presented a donation that will be used to support orthopedic programs at Huntington. The couple are long-time benefactors of the hospital. Sudden Infant Death Syndrome is classified as a sudden, unexplained death of an infant under one year of age, after a thorough investigation. The incidence of SIDS related deaths is currently less than one in 1000 live births. Published in the Journal of the American Medical Association, U.S researchers have found babies who die from SIDS make low amounts of the message carrying brain chemical serotonin. Serotonin is the chemical needed to regulate sleep, breathing and heart rate. Abnormal levels of serotonin may hamper an infant’s ability to regulate breathing, especially in challenging situations, such as breathing in too much exhaled carbon dioxide while sleeping face down. Research suggests the serotonin production abnormality is unmasked during sleep. Infants with an underlying vulnerability to SIDS can become fatal when combined with an external stress such as sleeping face down and rebreathing exhaled air. Infants with a normal brain stem will turn their head and wake up in response. But babies with an intrinsic abnormality are unable to respond to the carbon dioxide trigger. The current findings, by Dr. Hannah Kinney and colleagues of Harvard Medical School and Children’s Hospital of Boston, provide important clues to the biological basis of SIDS and may lead to ways to identify infants most at risk as well as, additional strategies for reducing the risk of SIDS in all infants. If you have any questions about this topic or our web site please click HERE and send us your comment or question. Bay Orthopedic has been selected to help design a Fracture Brace Kit that can be included in NASA's up and coming Mission to Mars Project. Bay Orthopedic was considered for the project on the basis of experience that they had in Space Suit bracing designs utilized in the Gemini and Apollo programs and original research projects on long bone fractures that were performed at the Hospital for Special Surgery in New York. This unique blend of experience has Team Bay Orthopedic hopeful that it can accomplish the goals that were laid out for them at a recent Midwest Orthopedic Convention in Cleveland. According to Michael Mangino, C.P.O., C.Ped. who is leading the project for Team Bay Orthopedic the parameters that were given us was quite unique. We were told that since the first flights to Mars were going to take so many months it would be impossible for an injured astronaut to expect to be rescued in time if they fractured an arm or a leg and that they would have to be able to treat themselves in outer space. Surgery would not be an option so they would have to be instructed to utilize a bracing system that they could assemble and don by themselves with the probability of no assistance. We still haven't been informed as to how many astronauts will be included in the first flights. In addition to the daunting task of self application of the orthoses they were also instructed that all of the componentry would have to be capable of being adaptable to fit either arm or leg and that the whole kit of components could be no bigger than a cigar box. Our team is up for the challenge states Mr. Mangino. “Our best looking design consists of universal knee and elbow joints, telescoping titanium uprights and flexible Teflon lined vacuum tubes, which will run the full length of the orthoses.” “ Our biggest obstacles will be how will it handle in the extreme cold and weightlessness of outer space.” The team expects that as soon as its satisfied with it's design that it could be tested at the International Space Station. after year to fight Cancer by funding Research Projects. With the rising popularity of individual and team sports in schools and with adult weekend warriors, Bay Orthopedic has developed Orthotic devices designed to keep you in the game. Injuries to the face and extremities are becoming more common place as competitive intensity increases between athletes. 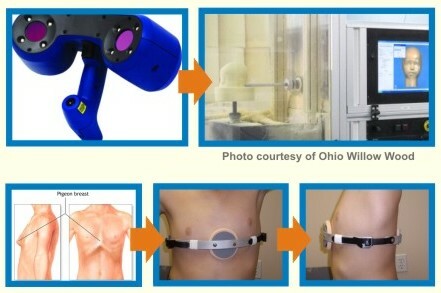 To address these injuries, Bay Orthopedic has developed the capability to make a digitized image of the head, face, extremities or torso, to custom fabricate devices that support and protect the athlete. Often called “Pigeon Chest Deformity” Pectus Carinatum (PC) is caused when the sternum or breast bone is pushed outward. The forward protrusion of the sternum often causes pain during exercise or during times of increased respiratory effort. A dynamic chest compression orthosis (DCCO) can be prescribed for children up to age 16 years old. This type of treatment dates back to 1979 when Haje and Bowen developed the first DCCO orthosis. The orthosis is designed to be worn 22 hours per day, to provide a comfortable, compressive force that slowly flattens the prominence. It is a light weight, low profile device which is easily applied and tightened. Orthotic treatment is strictly non-surgical, however; it does not preclude surgical intervention if correction is not obtained. For more information, please contact one of Bay Orthopedic’s offices and request the Pectus Carinatum informational brochure.